Presented to members of the Pittsburgh city board and in relation to the Pittsburgh 2050 initiative. 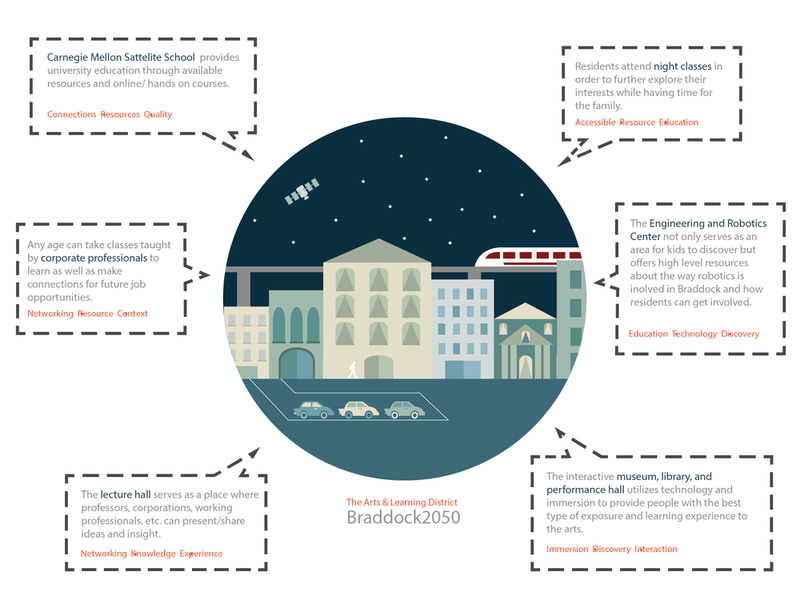 Braddock 2050 is an initiative to scope the potential development of the community and residence between 2013 -2050. This was achieved by evaluating the current situation of the county and understanding the needs of future urban environments. The design solution encompassed addressing issues around education, transportation, occupation, entrepreneurship, community spaces, and more. 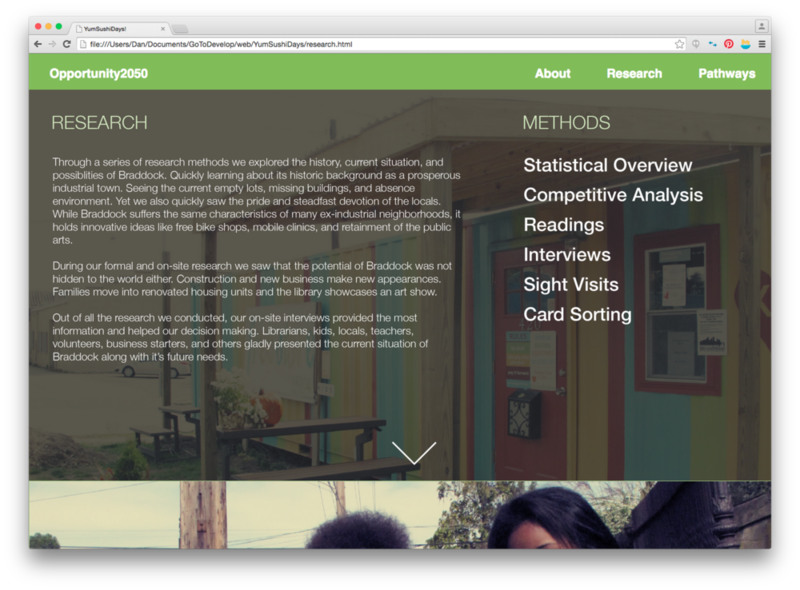 Role: Design Research, Design & Front-End Development: Assist in surveying and documenting the citizens of Braddock. Research into future urban development trends. Front-End design and development of the project's website. Pittsburgh is a city with visible pride and identity that is born out of its distinctive neighborhoods. These neighborhoods all have a rich history and culture that make them unique. Opportunity is identifying existing problem areas within a neighborhood in 2014 to help envision a future that is resource abundant without sacrificing the emblematic personalities of a community. We want to design solutions that will not only provide a multitude of opportunities, but allow sustainable growth into the year 2050 and beyond. A once thriving community built from industrial success, Braddock has slowly transitioned into a forgotten town filled with vacant lots and boarded up houses. Outsiders may have long given up on Braddock, but internally, community pride and a positive outlook on the future are present in the words and actions of any resident that you talk to. Braddock is poised to create many new and diverse opportunities. It has highly affordable land and flexible regulation, which makes it the perfect place for small startups and local businesses. Braddock’s local loyalty and community investment position it to welcome an influx of a new and diverse resident workforce. After years of static development, Braddock is starting to see new buildings, homes, and businesses move in at an incredibly rapid rate. 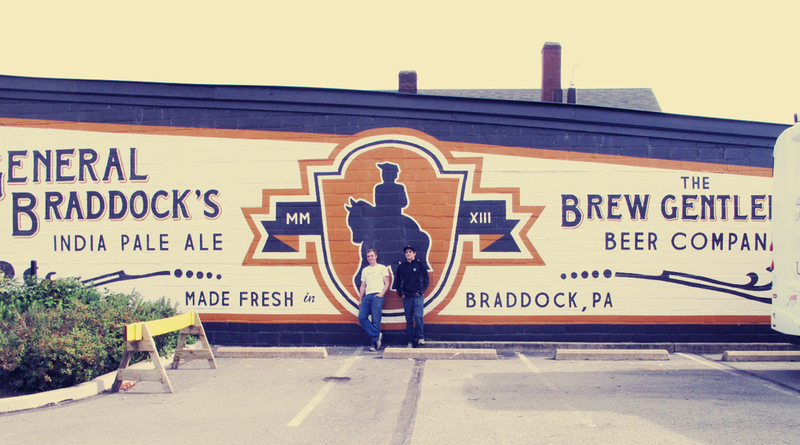 It is still a slow start, but the opportunities present in Braddock are not going unnoticed. What Braddock lacks in physical structures, it makes up for with the potential opportunity to grow into an economic, social, and educational hub. In order to better understand the people of Braddock and the needs of the town we made site visits in order to familiarize ourselves with the area, the people, the businesses, and the community environment. We conducted interviews with local startups, students, community center employees, librarians, and museum curators to try and understand the available resources and what the citizens were looking for. As we became more familiar with the needs of Braddock we began to formulate the different categories that needed to be improved in order for more opportunities to arise for residents. 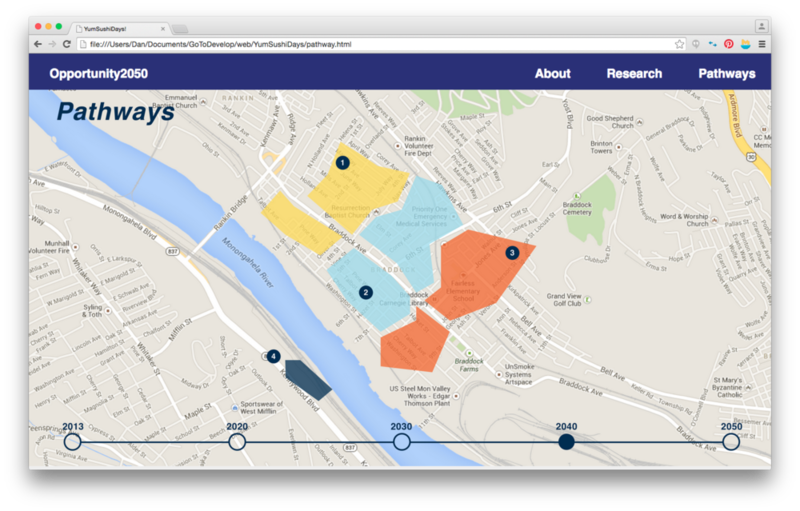 We began to plan out the changes that would occur every decade both in Braddock and globally, based on future signals, in order for the intended goal to be reached by 2050. We created a model persona family, which would be found in Braddock 2050. The family shows a combination of entrepreneurship, innovative learning techniques, adult learning initiatives, and more. 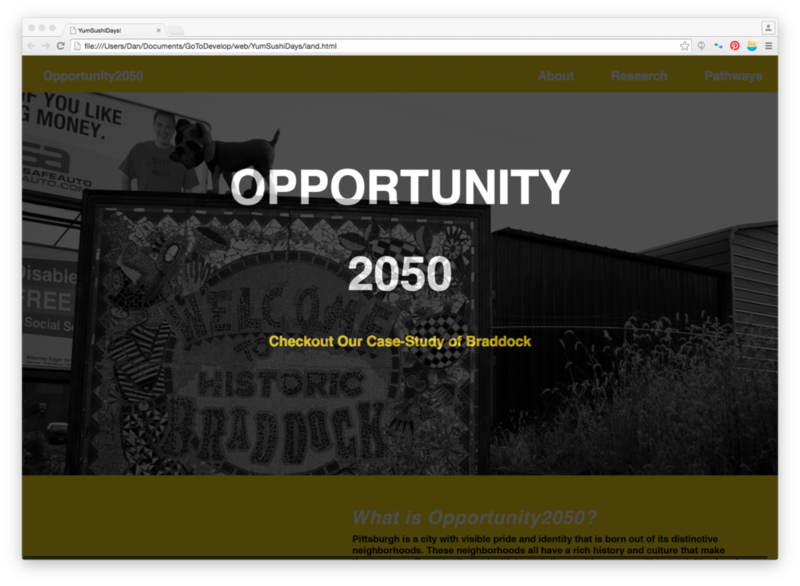 By showing three generations of a singular family we are able to create story line about the development timeline of Braddock from 2013 to 2050. As a result of our extensive research and feedback gathering we were able to create a solution. We wanted to address three larger categories (innovations, arts and learning, community) and then address specific components within those categories to indicate the new opportunities provided. Starting from the trends in 2013, we believe this solution is a realistic vision of 2050. 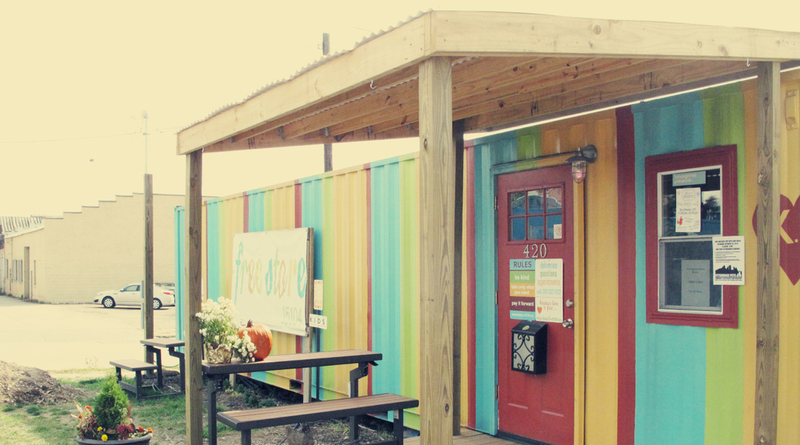 A community with thriving opportunities to learn beyond the modern day classroom and not only for children. An economy and community devoted to entrepreneurship. 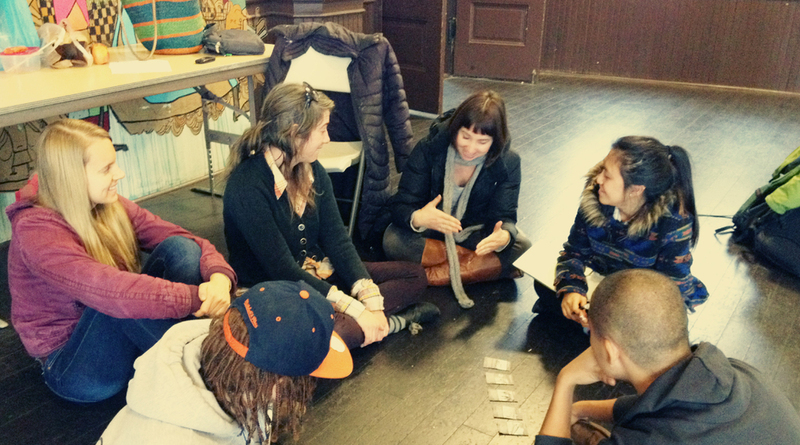 Lastly, Braddock would witness public spaces becoming utilized for discussions, learning, and sharing.